as you play the piano? Want to transform your technique but avoid exercises that fragment your body and disregard musical flow? Piano Portals is a mindful daily practice and radical substitute for Hanon et al. Piano Portals rewrites the rules. It prioritises crucial elements of able players' techniques that are all but neglected in orthodox pedagogy. Piano Portals is simple, honest and profound in its approach. It offers fresh hope to pianists who practise for long hours yet feel stuck or blocked. 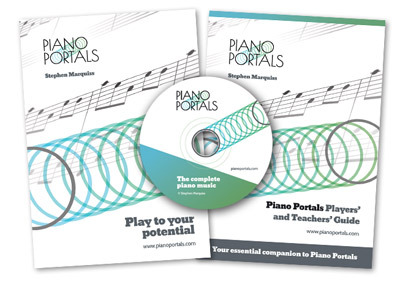 Piano Portals helps post-beginners to play fluently and confidently. It helps advanced players refine technique and avoid excess tension through deepening self-awareness. Piano Portals is open-ended and non-prescriptive. Revolutionise your playing in countless creative ways. Find fresh, surprising points of focus in your practice.